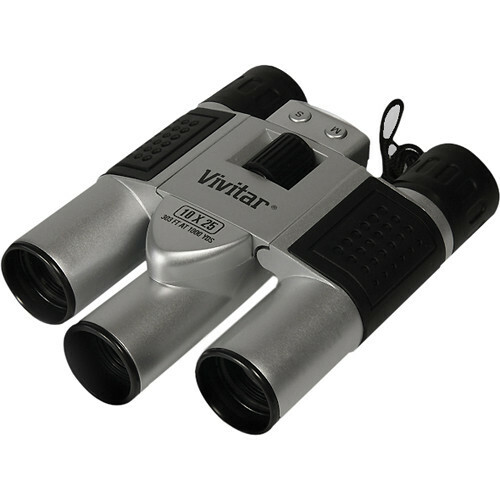 The 10x25 Digital Camera Binocular from Vivitar is a fun addition to any outdoor adventure. This take-along-everywhere optic features 10x magnification for high-powered viewing, and a built-in digital camera to record those eye-opening images. The integral camera system can be used to record what the viewer sees through the binocular. Up to 160 images can be stored on the camera's internal memory. Box Dimensions (LxWxH) 8.6 x 5.65 x 2.7"
10x25 Digital Camera Binocular is rated 3.0 out of 5 by 4. Rated 4 out of 5 by SCstarman from Binocular lets both eyes focus I gave the item 4 stars because of what it provides for the price. I am sorry that Jonartist did not understand how many binoculars work and thus trashed the design of this one on false grounds. The center focus knob adjusts the focus of both eyes and the right eyepiece has a helical focus adjustment to set the difference between your two eyes if there is a difference. The adjustment is set by focusing on something using the center know with the eye up to the adjustable closed (usually the right eye), then closing the first eye, opening the other eye and focusing on the same object using the helical adjustment. From then on the center adjustment with bring both eyes into focus. Rated 1 out of 5 by jonartist from Spend a little more $ If camera binoculars are what you need DO NOT BUY THIS PRODUCT. I received a pair as a gift so I shouldn't complain...but you cannot focus the left scope and the right scope independent of one another and the one I have has the two sides out of sync. SO when one side is in focus the other side is blurry...when you focus the blurry side then the focused side becomes blurry. You cannot get a focused view of the subject..... not a good thing. Add to that a very unfriendly display screen and you have a product that is not worth buying. Rated 3 out of 5 by Farmer from Right eye piece is adjustable This is a pretty basic digital camera binocular, given the modest price. Contrary to another review, the right eyepice is independently adjustable. Rated 4 out of 5 by Site Seer from Great Value Reasonably priced and compact, perfect travel item. Is it compatible with Apple? This is a Windows only device. I was given a 10x25 but it doesn't have the instruction booklet with it. How can I get a bookelet? Asked by: Charles m s.
can pictures can be printed ? Yes they can, with a computer and printer or downloaded to a disk and taken to Walmart. missing usb cable. Can you tell me the size usb port in the camera? IS THE CV 1025V iMAGEMAKER SOFTWARE COMPATIBLE WITH WINDOWS 7.? Yes it is compatible with Windows 7. I do not have a manual,what does the m or s stand for? A M IS For Menu . What is the max photo resolution?